Using ingredients you can pronounce, Dr. Laura grew up making healthy cookie recipes with her mom. Creating healthy treats with tasty, exciting flavors. Each healthy cookie made by Laura’s Wholesome Junk Food follows in this tradition. Our passion is making deliciously decadent healthy cookies for everyone to enjoy. In addition to her yummy, sweet & healthy treats, look for more healthy cookie recipes in Dr. Laura’s book, The Wholesome Junk Food Cookbook. To create delicious, great-tasting wholesome, healthy cookies and healthy cookie recipes using only high-quality ingredients. To increase happiness and health on earth by consistently providing excellent healthy cookies to our consumers and amazing customer service to our clients. To maintain and improve upon a streamlined business model that allows us to run profitably and smoothly allowing us to grow at a sustainable rate and pay an excellent wage to the people who put their time and energy into working for us. Are you searching for a healthy cookie that delivers on taste? Our healthy cookies are deliciously decadent, without the guilt! Made primarily with date sugar, our healthy cookies satisfy your craving for sweets without that energy draining sugar crash later. Nibble a healthy cookie (or two) and we’re sure you’ll agree. Our healthy treats are packed with flavor to tease your tastebuds. All of our healthy cookies came about naturally. What does this mean? This means that each healthy cookie and each healthy cookie recipe at Laura’s WJF arose from a desire to fill the nutritional needs of real people eating real food. The making of each cookie springs from the experiences of Dr. Laura – either from her own childhood, or her experiences with real people facing the challenges of healthy eating. Her philosophy is simple – to make great tasting, healthy cookies that everyone can enjoy. Her wholesome healthy treats are made with the purest ingredients – for instance, we use only non-GMO soy and unsprayed, unsweetened coconut; you won’t find the additive/preservative bisulfite here! Healthy enough to eat for breakfast, our moist and chewy bite-lettes ® use whole grains, fruits and natural sweeteners to sustain energy and deliver a filling snack. Vegan, kosher, and cholesterol free, our healthy cookies are the perfect portion size for lunches, afternoon snacks, trail food, and more. We offer several tantalizing flavors to choose from: Oatmeal Chocolate Chip, Oatmeal Raisin, Xtreme Fudge, Cranberry Breakfast and Vanilla Vanilla. Our delectable, healthy cookies will please the novice to the gourmet! If you’re already a fan (or want to become one) and would like a healthy cookie recipe featuring our bite-lettes ®, visit our healthy cookie recipe page for tempting ideas on how to serve up your favorite flavors. Also, look for Dr. Laura’s The Wholesome Junk Food Cookbook. 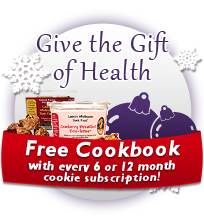 It’s filled with healthy cookie, pie, cake, and snack recipes for everyday snacking. Even though so many of the recipes in the Wholesome Junk Food Cookbook are delightfully easy, I’m still always looking for ways to simplify the preparation process even more. So if the recipe calls for butter or oil and then honey or agave or molasses in the same quantity, I use the same measuring cup for both: I measure the shortening first - and the sweetener will slide right out of the cup!